THE HON (ROBERT WILLIAM) HUGH O'NEILL was the third son of the 2nd Baron O'Neill. Having served in the Army as a major, O'Neill entered politics and became the Northern Ireland parliament's first Speaker. He was appointed to the Privy Council of Northern Ireland and became Lord-Lieutenant for County Antrim, 1949-59. 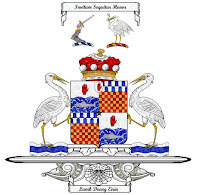 The 1st Baronet was elevated to the peerage as BARON RATHCAVAN in 1953, when the baronetcy merged with the barony. The 2nd Baronet and 2nd Baron undertook a not dissimilar career pattern as his father, entering politics having served in the Army. He was, it is thought, a founder member of the Alliance Party of Northern Ireland. The seven-bedroom Georgian house on five and a half acres is owned by Bridget Lady Rathcavan, widow of the well known Northern Ireland politician, Sir Phelim O'Neill. 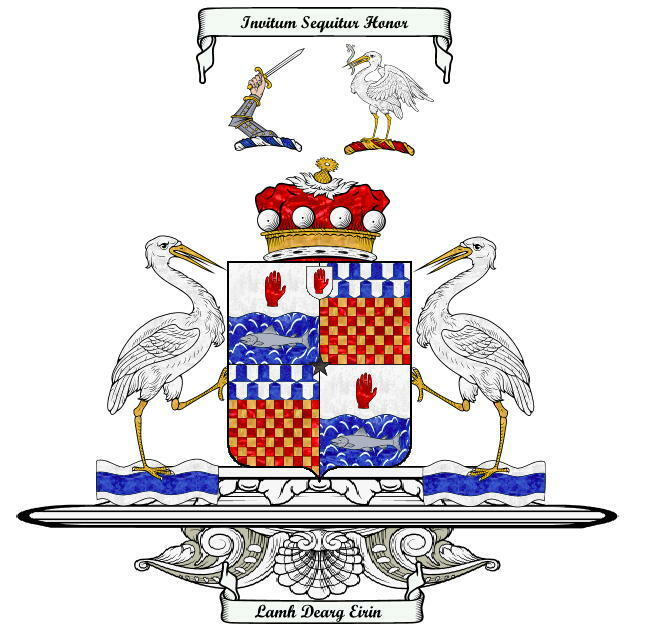 The 3rd Baronet is the present Lord Rathcavan. CLEGGAN LODGE, near Broughshane, County Antrim, has been owned at various times by the O'Neills and the O'Haras. It is two-storey, with a front of two bows linked by a wooden first-floor balcony. There are double gables. The roof formerly thatched and windows at one time latticed. There is an octagonal drawing-room and dining-room; and an imposing double staircase. There are modern additions to the rear. Formerly a shooting lodge for Shane’s Castle, the site is known to have been in existence in 1777. Extensive landscaping and tree planting were carried out, presumably as shelter and cover. Cleggan Lodge was built by the 1st Earl O’Neill in 1822 in order to keep one of his mistresses, and as a shooting lodge on the edge of his extensive grouse moors in north Antrim. He died without a male heir and, after Gladstone’s Irish Land Acts, the great estates diminished. In 1927, Sir Hugh O’Neill, 1st Baron Rathcavan, bought the Cleggan Estate. It was renovated in the 1920s in a fine elevated site with views of Slemish. A ha-ha separates the house from parkland. There are good mature trees in the parkland and in woodland. A considerable area was once ornamentally planted. A lake is drained at present. A pond, Fisher’s Pond, was added sometime before 1857 and a rockery made in the glen by the present owner's grandfather post-1927. These features are partially maintained in that paths are kept clear. A cultivated and productive garden is kept at the house in immaculate order, including herbaceous borders, a hot house and frames. This present garden is post-1927. One of the two gate lodges survives. Cleggan estate extends to about 1,000 acres and is renowned for The Cleggan Shoot. First published in June, 2010. Rathcavan arms courtesy of European Heraldry. The prices in the Brompton bar & grill are very reasonable indeed for London..for anywhere in fact. BB&G is dog-friendly which may be of interest to some of your readers.